Dr Moharamzadeh is a specialist in Periodontics and Restorative Dentistry and takes referrals at T Clinic for these and for Legal reports for Accidents, RTAs, PI (Personal Injury) and Clinical Negligence in the fields of Periodontics and Restorative Dentistry. Dr Moharamzadeh graduated from the University of Tehran in 2003 with a double degree in Dentistry and Chemistry. Since graduating Dr Moharamzadeh has gone on to further his education through a PhD in Restorative Dentistry from Sheffield University in 2006, as well as completing various post graduate courses and acquiring fellowship from the esteemed Royal College of Surgeons England. These qualifications have led to Keyvan being recognised as a dental specialist in multiple disciplines, including Restorative Dentistry, Periodontics, Endodontics and Prosthodontics. 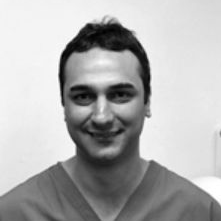 In 2007, Keyvan joined Sheffield University as a clinical lecturer in Restorative Dentistry and has since been promoted to Senior Clinical Lecturer and Consultant in 2016, as well as being the programme director for the postgraduate periodontics course.